The SeaWorld theme park in the US state of California is to phase out controversial public displays by killer whales, its chief executive has said. Joel Manby announced that 2017 will be the last year of the show in San Diego. He said that the move was part of a strategy that seeks to reverse falling visitor numbers at the company's 11 parks across the US. The company has faced intense criticism by activists who say keeping the whales in captivity is cruel and unnecessary. Its shares have halved in value since the release of a critical documentary film two years ago. Dramatic displays by killer whales are the centrepiece at three parks operated by SeaWorld, in California, Florida and Texas. But the parks have long been criticised by animal rights activists and some politicians, who argue that keeping the mammals - also known as orcas - in captivity is cruel and unnecessary. In October, Californian authorities prohibited SeaWorld from breeding animals in captivity, calling into question the future of the park's popular killer whale attraction. The BBC's Los Angeles correspondent James Cook says the San Diego show will reportedly be replaced with a new orca experience in a "more natural" setting but it is not clear what exactly that will involve. Vice-President of Communications at SeaWorld Fred Jacobs told the BBC that the changes reflect "input received" in San Diego. "It does not affect our other parks," he added. When it comes to what exactly SeaWorld is planning and why, the waters are muddy. The company made its announcement in a conference call with investors, rather than a news conference with journalists. As a result it has dodged scrutiny. The BBC put specific questions to SeaWorld by email, including the following. Why is the current display in San Diego ending? Will the new display involve any element of performance by the orcas? Why are the existing displays to continue in Texas and Florida? The answers were cursory, with SeaWorld saying it had not yet decided "what specific behaviours" would be in the new presentation and failing to explain the logic of differing approaches in its different parks. Until it answers such questions in full, SeaWorld is likely to remain under intense pressure from opponents who range from activists to politicians to pop stars. Chris Butler-Stroud, the chief executive of Whales and Dolphins Conservation UK, told the Today programme that the changes announced by SeaWorld were insufficient. "All we're really suspicious of is that this is just a repackaging of the show to get round some of the bad PR they've been experiencing over the last few years," he said. SeaWorld's popularity was damaged and attendance fell at its parks - especially in California - following the critically-acclaimed 2013 documentary Blackfish, which highlighted the impact of captivity on orcas. SeaWorld has dismissed the documentary as inaccurate and misleading, pointing out that it has not captured a whale in the wild for 35 years. There was mixed social media reaction following SeaWorld's announcement. 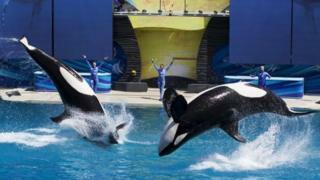 The park at San Diego is the company's second biggest and features its famous "Shamu" killer whale show. SeaWorld also suffered a setback when One Direction's Harry Styles urged concertgoers to boycott the chain of aquatic theme parks in July. The company has since sought to improve its fortunes with a fresh marketing campaign and discount offers.